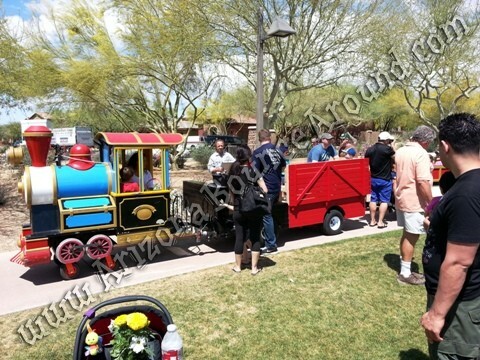 Our electric trackless train is a high capacity kids train perfect for train parties or special events. 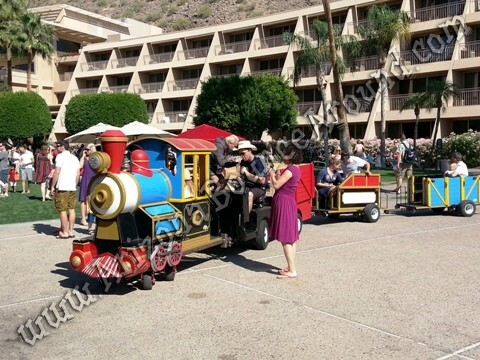 Our Arizona Express trackless train is a beautiful trackless train built in Italy complete with train horn and a train bell. 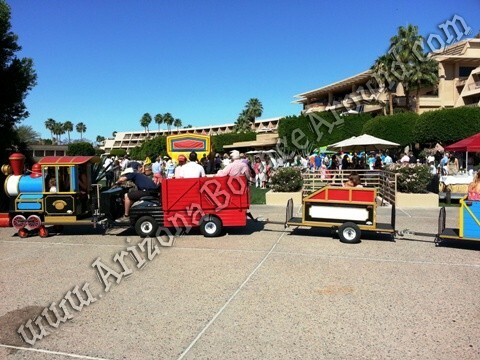 This trackless train is very unique and a one of a kind train rental in Arizona. 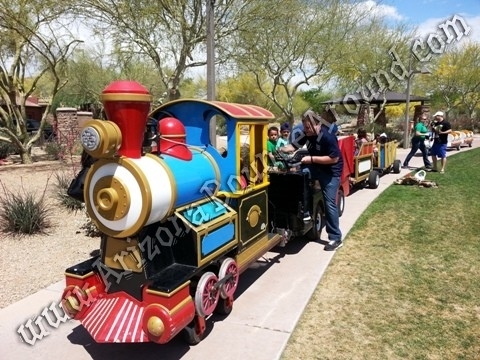 This train was custom built for Arizona Bounce Around and allows kids to actually ride in the front engine of the train. 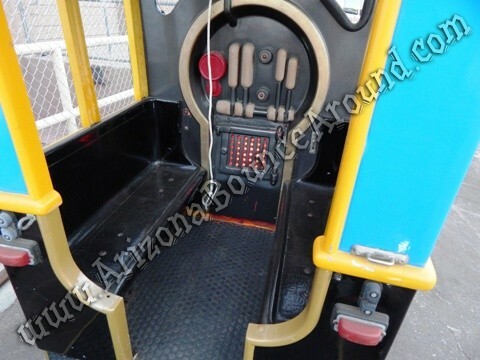 Up to 4 kids can ride in the front train just like a real train conductor and ring the bell and blow the horn. 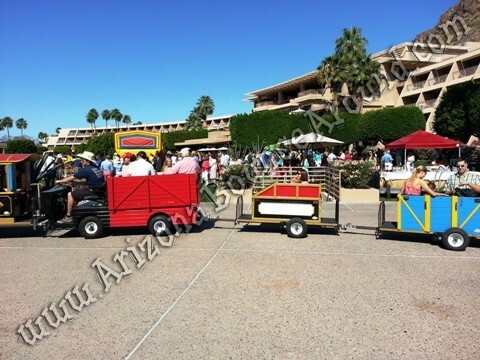 Our Arizona Express trackless train pulls 2 train cars that will hold 6 to 8 kids per car depending on the size so a maximum capacity of 20 kids per ride. This trackless train is very powerful and can run all day on a single charge with no fumes or noise. This is a fully electric trackless train and can be driven indoors or out so rent it today for your next train or holiday party. What a better way to see the Christmas lights in your neighborhood than on the Arizona Express trackless train. 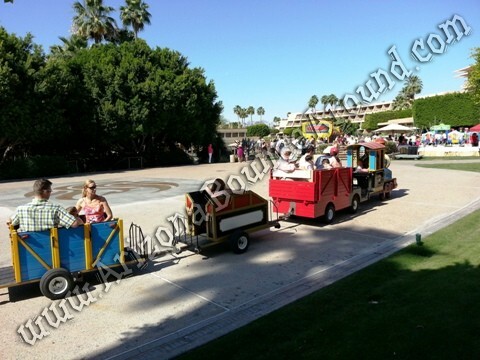 This trackless train has the sound of a real locomotive train horn! We've replicated the deep rumbling tri-tone sound of a freight train air horn and installed it on the Arizona Express. The train horns are all metal and have a sparkling chrome finish. Sound output can reach 150+ db. This train horn has extra-wide bells for an authentic sound that will have people wondering where the railroad crossing is. Our train horn is powered with an 110 PSI air compressor & air tank onboard.